Green OA publishing refers to the self-archiving of published or pre-publication works for free public use, sometimes after an embargo period required by the publisher has ended. Authors provide access to preprints or post-prints (with publisher permission) in an institutional or disciplinary archive such as W&M ScholarWorks and arXiv.org. Gold OA publishing refers to works published in an open access journal and accessed immediately upon publication via the journal or publisher's website. Publishing costs ("article processing charges") if charged are often borne by the institution or by a subsidy. Examples of Gold OA include PLOS (Public Library of Science) and BioMed Central. Bronze OA publishing refers to works available on websites hosted by their publisher either immediately or following an embargo but not formally licensed for reuse. Open access (OA) refers to content freely available on the public internet and which carries less restrictive copyright and licensing terms than traditionally published works, but it is copyrighted. While OA is a newer form of scholarly publishing (which is commonly described as starting in 2002), many OA journals comply with well-established peer-review processes and maintain high publishing standards. 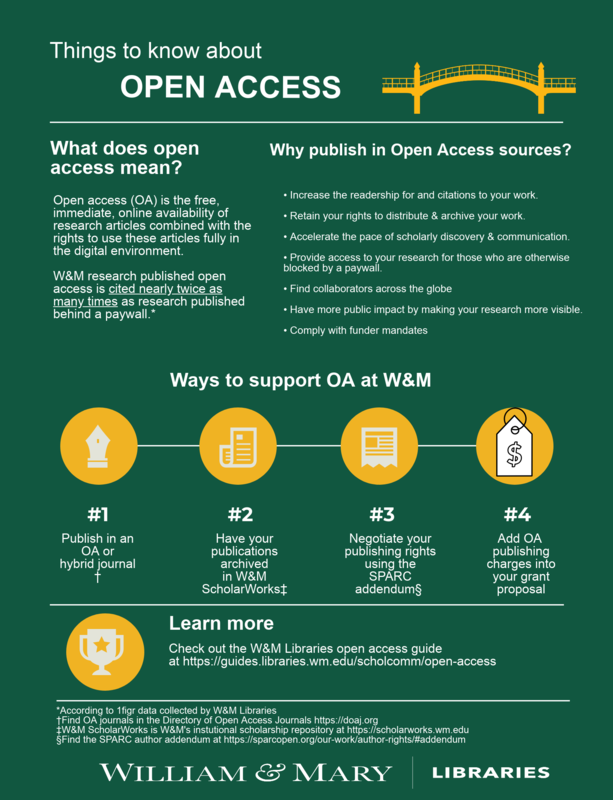 For more information, see Peter Suber's overview of Open Access: http://legacy.earlham.edu/~peters/fos/overview.htm. They are reviewing, making information available and having discussions with the campus community on their "Big Deal" subscriptions, in line with other Virginia doctoral institutions. They provide an open access repository of W&M research and scholarship, W&M ScholarWorks. They support several open access initiatives, such as the Directory of Open Access Journals (DOAJ), Knowledge Unlatched, arXiv and more. Offering information including faculty workshops on free textbooks (Open Education Resources, OER) and promoting funding opportunities for authoring, adapting or adopting them.